The new Top Gear, starring Chris Evans and a menagerie of other people who don’t deserve such prominent mean-mugging, is coming next week whether you like it or not. We’ve got a rundown of the first full episode, thanks to TopGear.com, and good news old Top Gear fans! It sounds very Top Gear. In case you have a lot of trouble with reading comprehension and couldn’t understand that from the first paragraph, that means that MANY SPOILERS for the first episode of new Top Gear lie below. Right, let’s get into it. It sounds like it’s going to be following the standard three-segment format for familiarity’s sake, with the first segment up comprising a “celebration” of Top Gun. Chris Evans, of course, is first up with Sabine Schmitz, and they’ll be comparing the Dodge Viper ACR against the Chevy Corvette Z06 in Nevada, which will probably be great in execution despite being a bit 1990s-American-glossy-mag in concept. Not sure what that has to do with Top Gun, either, despite seeing a fighter jet somewhere in the trailer, but who knows, could be good!!!!!!!!!!!!!!!! Next up, Matt LeBlanc takes the absolutely bonkers Ariel Nomad, a dune buggy with horse steroids injected directly into its face, across the sand in Morocco. And finally, LeBlanc and Evans are going to have some sort of competition in Reliant Rialtos, which was the slightly-updated replacement for the original Reliant Robin which old Top Gear liked to have so much fun with. It’s all very meta. The biggest change, beyond the hosts, might actually come in the form of the Star In A Reasonably Priced Car segment. The format is either going to be different, or they’re just going for the old incredibly-odd-couple trick, as the guests are going to be Jesse Eisenberg (that guy from The Social Network) and Gordon Ramsay (that guy from the cooking and the screaming). Unusually enough, we haven’t heard anything yet about the other hosts in the stable – Chris Harris, Rory Reid, and Eddie Jordan – appearing anywhere in this episode. But we’re reserving full judgment until we see it ourselves. 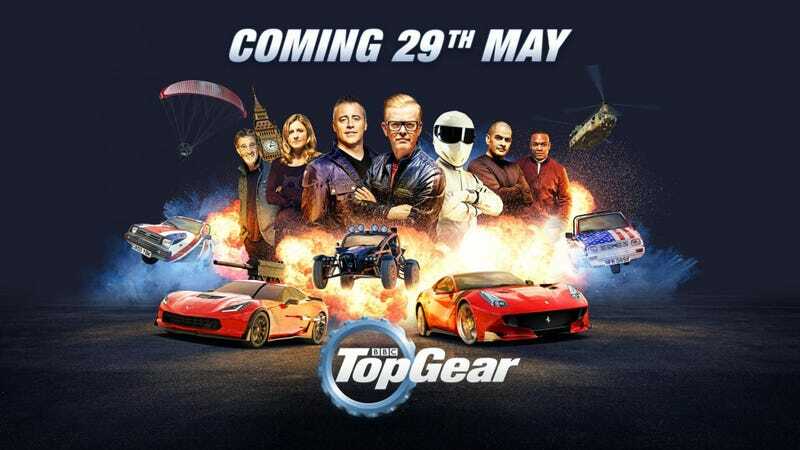 The new Top Gear premieres May 29th in the United Kingdom, and Monday, May 30th everywhere else. Your ever-faithful los Jalops will be liveblogging the American premiere, so make sure to watch it with us. It’s going to be very interesting, no matter what happens.